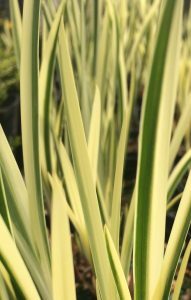 Nifty foliage perennial that can double as a terrestrial border plant (with regular water in rich, moisture-retentive soil) or submerged as a border perennial in a water pot or the edge of the pond. 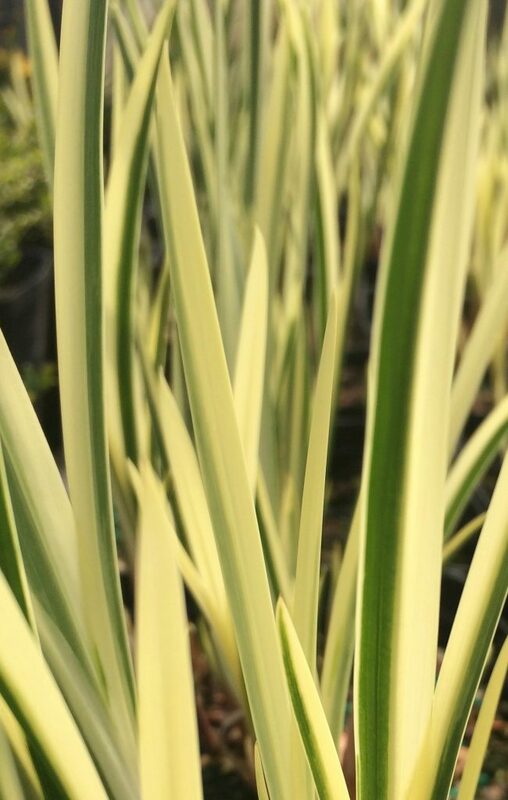 The majority of the spikey 3′ tall leaves are composed of cream/ivory streaks with dramatic stripes of deep green. The effect is ghostly and vivid from quite a distance away. Forms large spreading clumps in time. To 4′ wide when things are going well. Full sun to part shade. Flowers are not very conspicuous spikes that hide within the foliage. Completely winter deciduous- this is nice, it makes cleaning up in late winter/spring easy and and no fuss and the plant begins anew and fresh each season. Not bothered by pests. If sunk in a pond or water pot use heavy clay soil- like from the ground and mulch with a layer of gravel. Long lived plant. High deer resistance. AKA. Ghost Sweet Flag.